The visit to the Dr.'s today went really well. My blood work came back with the sugars going from 14 to 10, blood pressure almost normal 135/83. My kidneys are as he put it "the healthiest he's seen in a long time". My total cholesterol is slightly high 5.63 but my LDL is 3.01 which is good but he and I want it down to 1.5 mmol/L. He has given me 3 months to get it down or he wants to add meds for that too. He feels that with the changes and the numbers I'm showing right now that in 3 months he will be removing the meds I currently take and see "pristine" numbers across the board. I'm going to work hard towards that. Tonight I made veggie lasagna for dinner. It went over well though son said he would rather have some meat in it. Couldn't have been that upset as he ate 2 large pieces of it. I also made whole grain garlic bread. I made my own garlic butter but did buy the whole grain Italian bread (Real Canadian Superstore). I am so full but don't have that sickening bloated, tired feeling I get after eating my meat lasagna - and that's the only difference was no meat and tonnes of veggies. 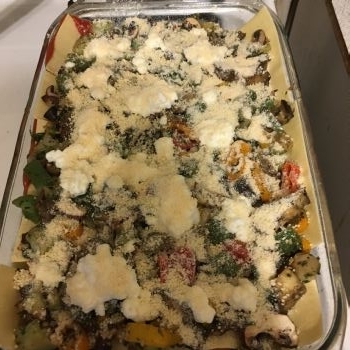 Still used fresh lasagna sheets (was to lazy to make my own so they are store bought) and cheeses (Parmesan, mozzarella and cottage cheese). The weather is suppose to change starting tomorrow. They're calling for alot of snow in the next 5 days. Just in time for my in-laws to come home from Florida for a few weeks. Their due back on Monday and we'll try to get over and see them next week as long as the weather co-operates. Both the kids are working Christmas Day so I will make dinner for us, which over the years I've really come to enjoy doing. I'm already looking to see what I can add/change without to much rioting.